To say that I looked forward to this one is a huge understatement. To begin with, I must say that Therion is a pretty new acquaintance for me even though they have been playing since the early 90’s. 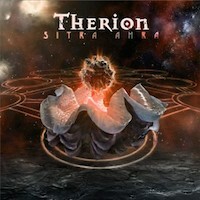 Much have happened with Therion since their early Death Metal days. Nowadays the band is more of a operatic metal band and the brutal riffing and growling is long gone and was more or less gone on their twin release of the albums Lemuria and Sirius B (2004). Those albums were my first acquaintance with the band and those CDs are ok, but they didn’t make me a fan. That happened with their last album, Gothic Kabbalah (2007), now a big favourite of mine. That meant that I had some really big expectations for this one. But much has happened since they released and toured that album. First, the whole band except for band leader Christoffer Johnsson and singer Snowy Shaw has jumped the ship. And on Gothic Kabbalah, all the members were participating a lot in the songwriting area which of course affected both music and sound a great deal. And there are some musical differences between Gothic Kabbalah and this one. Where Gothic Kabbalah was very melodic, catchy, but with a sound of its own and never low on heaviness, this one feels somewhat more like an opera. The first couple of spins left me a bit disappointed, but after a little adjustment from my side I could only surrender, because this turned out to be a really great album. New singer (yes, they have a few) Thomas Vikström, who replaced the magnificent Mats Levén, fits in perfectly and the new band feel tight (Drummer J. Koleberg and bass player Nalley Påhlsson has played together in many different constellations before, most recent in Randy Piper’s Animal) and the production and arrangements are great. Stuff like the title track, ”Hellequin”, ”2012” and ”Cú Chullain” are just brilliant, showing off killer vocals, both male and female. ”Din” is a hard and aggressive piece with a nod back to Therion’s old Death Metal days. But best of all is ”Land Of Caanan” – an opera in just one song and a little masterpiece. As an album, it is not as direct as Gothic Kabbalah, that really wasn’t really that direct either, but it was a bit more song oriented and to be honest, this album is not as good, but it is pretty close once you have gotten into it properly. And it’s a bit harder to get into. But fear not, if you don’t get it the first time, hang in there, because you will. The reward for your patience will be some really great music that’s gonna stay with you for a long time. I suggest you start now.